New government data suggest that some colleges and universities are graduating as few of one out of 10 of the low-income students whose educations are being subsidized by taxpayers to the tune of more than $30 billion a year. Why It Matters: Government figures show that the socioeconomic divide in higher ed is widening. The information was released on request by the U.S. Department of Education, which has now posted lists of which colleges and universities do the best at enrolling and graduating recipients of Pell Grants. The federal grants go to children of families earning about $40,000 a year or less and who are considered low income. The full report can be found here. The report does not list the schools that do worst by this measure. But the data on which it based its ranking show that some institutions enroll very small proportions of low-income students, while at others low-income students are unlikely to graduate. The figures further demonstrate the widening socioeconomic divide in which wealthier students increasingly enroll at elite private and flagship public universities while lower-income ones are relegated to second-tier public and for-profit institutions and community colleges with fewer resources and often poor success rates. In all, Pell Grant recipients make up 40 percent or more of the enrollment at barely 50 public colleges and universities and about 100 private, nonprofit ones, or fewer than one in 10, the Department of Education said. Because universities and colleges themselves are not required to disclose the graduation rates of their Pell Grant students to the government, the Department of Education has instead calculated them by using a database that was designed to keep track of student loans. This means the many students who get Pell Grants but don’t take out any loans to pay for college don’t show up. As a result, The Hechinger Report found, these figures are off by an average of 10, and as much as 59, percentage points. For its rankings, however, the Department of Education took the unusual step of relying instead on graduation data collected by someone else—The Education Trust, which advocates for low-income students. The Education Trust did not calculate the six-year Pell graduation rates of every university and college, however, so hundreds are not included in the data. 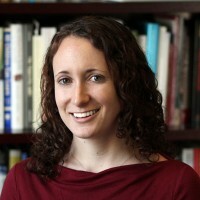 Among those that are, the ones that enroll the smallest proportions of low-income students who get Pell Grants include Washington University in St. Louis (6 percent), Elon University (9 percent), Washington and Lee (10 percent), Colorado College (10 percent), Kenyon (10 percent), and Whitman College in Washington State (10 percent). Many of these schools have comparatively high graduation rates for the few Pell recipients they accept, from 70 percent at Elon to 92 percent at Washington University and Colorado College. Leo Lambert, president of Elon, said the university is proud of its graduation rate, and is raising money for financial aid so it can increase the proportion of its students who are eligible for Pell Grants. Kenyon spokesman Mark Ellis said 91 percent of that university’s Pell Grant recipients graduate, an even higher proportion than their classmates. But Ellis said that, because students eligible for Pell Grants often also need other financial support, private, nonprofit schools like Kenyon with comparatively small endowments can’t afford to admit many more of them. Colorado College has increased its proportion of Pell students to 15 percent, spokeswoman Stephanie Wurtz said. Their graduation rate, too, is higher than for the general student population, Wutz said. At other institutions, there are huge gaps between the graduation rates of all students and of low-income students. Forty-six percent of the students at St. Andrews University in North Carolina, for example, graduate within six years, the federal data show. But only 13 percent who receive Pell Grants finish within that period of time, a difference of 33 percentage points, and the biggest such disparity in the nation. 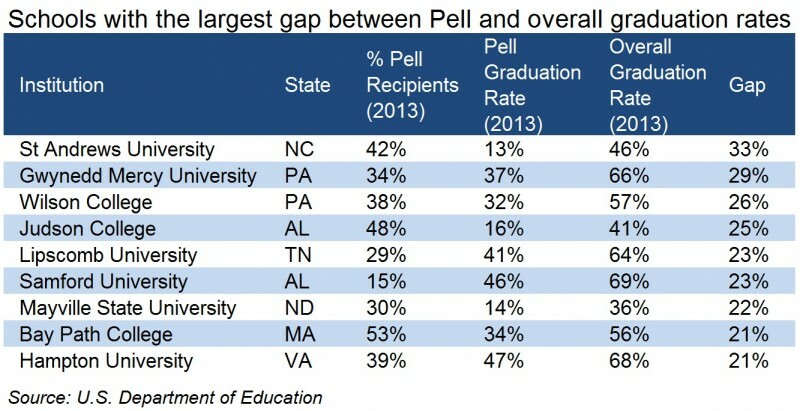 At other institutions, only around one in 10 Pell Grant recipients graduate. Among these, the worst-performing is the University of Maine at Augusta, where 57 percent of the students get Pell Grants, but only 9 percent finish within six years. The university’s low-income students “oftentimes have major life circumstances that make getting a college education much harder for them,” spokeswoman Rachel Paling said. She said they’re offered extra academic support, tutoring, and counseling, and that the university hopes to expand these services with the help of a nearly $400,000 federal grant it was awarded in January. Other institutions whose Pell Grant recipients graduate at low rates, according to the federal figures, include Franklin University of Ohio (11 percent), Bluefield State College (12 percent), Jarvis Christian College (12 percent), Nevada State College (12 percent), Western New Mexico University (13 percent), Coppin State University (14 percent), and Mayville State University in North Dakota (14 percent). Only one of these, Nevada State College, responded to requests for comment. 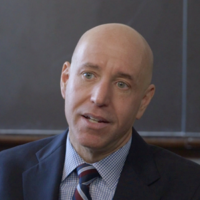 Its president, Bart Patterson, said many students at his school who qualify for Pell Grants don’t apply for them; most do not begin as freshmen but arrive as transfer or mid-career students; and some who do start there may transfer somewhere else. All of those things depress the graduation rate. “We’re actually pretty proud of where the college is at, and this is an example of how federal government statistics can grossly distort the situation at an individual university or college,” Patterson said. The government report said schools with low graduation rates for Pell Grant recipients face many of the same challenges of rival institutions that nonetheless manage to fare much better. In addition to leaving out institutions for which The Education Trust did not compile graduation rates for Pell recipients, the government statistics have other shortcomings. One of the institutions that appears on the list of schools with poor graduation rates for low-income students, for instance, is the University of Maryland’s University College, which offers courses only online, and fewer than a quarter of whose students get Pell Grants. Many are taking courses there with no intention of earning degrees. Another, the State University of New York’s Empire State College, said the average age of its students is 30, which changes the measure of traditional graduation rates. A third, the University of Arkansas at Little Rock, also enrolls mostly nontraditional students, many of whom are raising families and taking slimmer course loads, a spokeswoman said; on average, she said, it takes them nine and a half years to graduate.